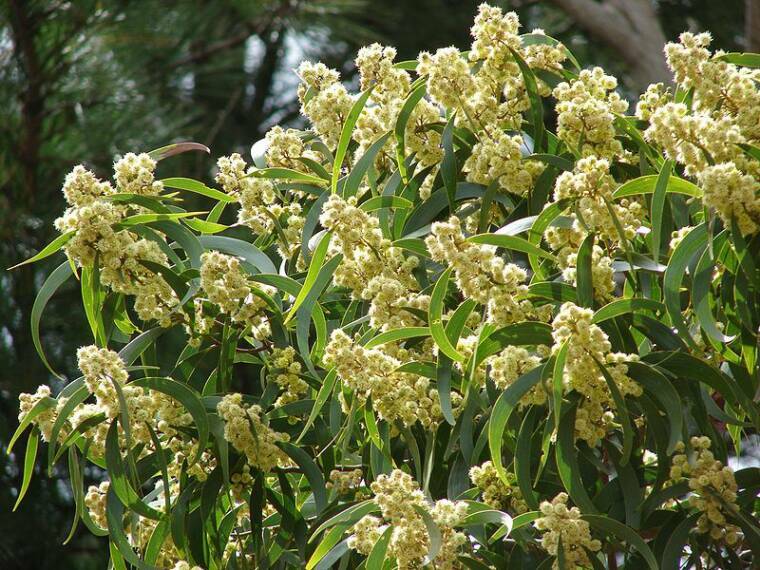 The Acacia koa (Ko-ah) is a species of flowering tree in the pea family, Fabaceae. 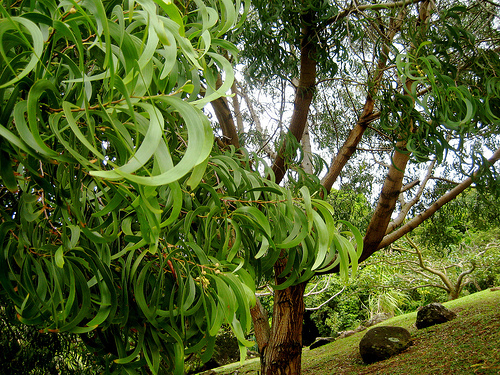 It is endemic to the Hawaiian Islands, where it is the second most common tree. The highest populations are on Hawaii, Maui and Oahu. Its name in the Hawaiian language, "koa", also means brave, bold, fearless, or warrior. Upper branches of a koa tree, showing the bark, sickle-shaped phyllodes, greenish rounded flower heads, and seedpods. Koa is a large tree, typically attaining a height of 15–25 m (49–82 ft) and a spread of 6–12 m (20–39 ft). In deep volcanic ash, a koa tree can reach a height of 30 m (98 ft), a circumference of 6 m (20 ft), and a spread of 38 m (120 ft). 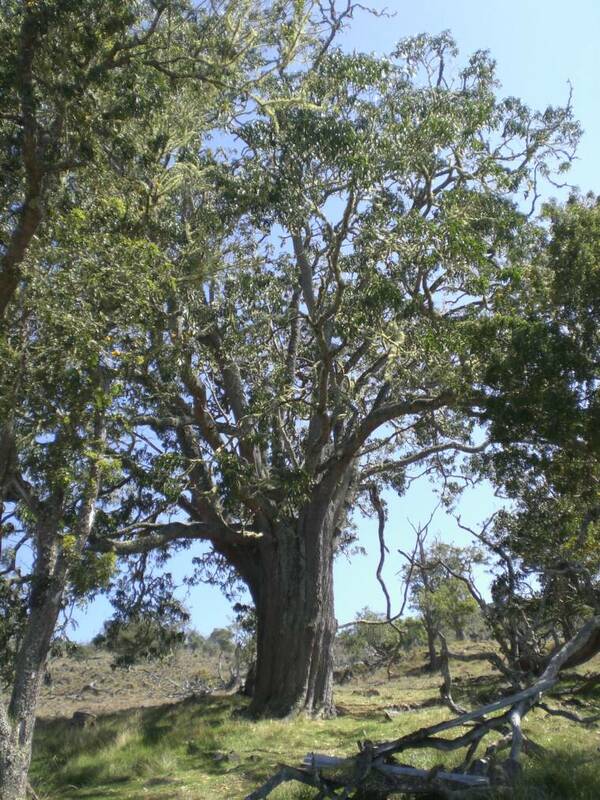 It is one of the fastest-growing Hawaiian trees, capable of reaching 6–9 m (20–30 ft) in five years on a good site. 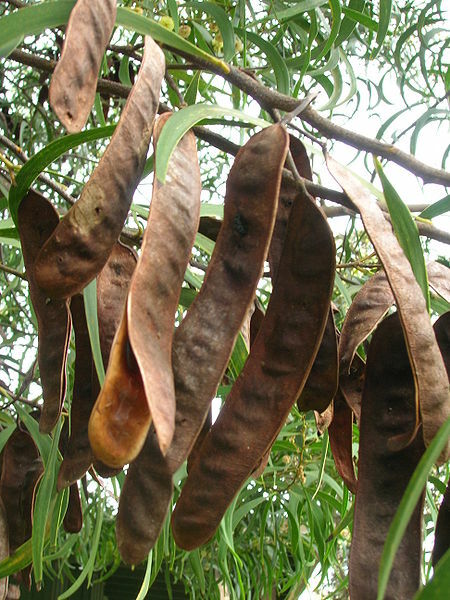 Initially, bipinnately compound leaves with 12–24 pairs of leaflets grow on the koa plant, much like other members of the pea family. At about 6–9 months of age, however, thick sickle-shaped "leaves" that are not compound begin to grow. These are phyllodes, blades that develop as an expansion of the leaf petiole. 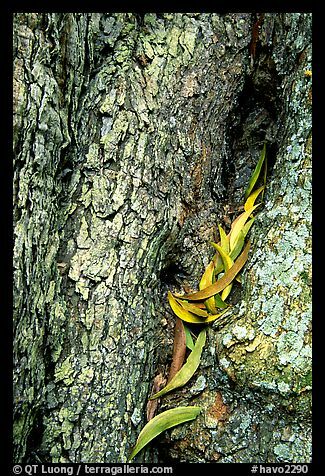 The vertically flattened orientation of the phyllodes allows sunlight to pass to lower levels of the tree. True leaves are entirely replaced by 7–25-centimeter (2.8–9.8 in) long, 0.5–2.5-centimeter (0.20–0.98 in) wide phyllodes on an adult tree. 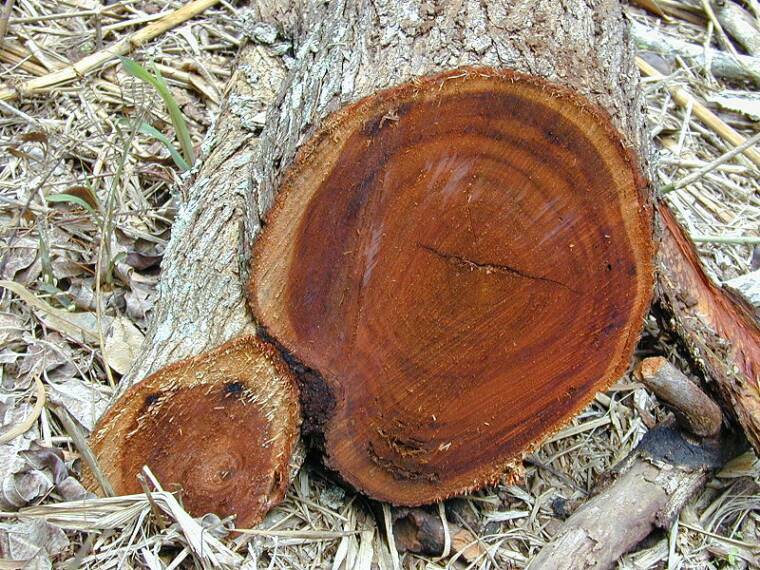 Fruit production occurs when a koa tree is between 5 and 30 years old. The fruit take the form of pods with a length of 7.5–15 cm (3.0–5.9 in) and a width of 1.5–2.5 cm (0.59–0.98 in). Each pod contains an average of 12 seeds. The 6–12 mm (0.24–0.47 in) long, 4–7 mm (0.16–0.28 in) wide seeds are flattened ellipsoids and range from dark brown to black in color. Seeds are covered with a hard seed coat, and this allows them to remain dormant for up to 25 years. Scarification is needed before koa seeds will germinate. Koa is endemic to the islands of Hawai'i, Moloka'i, Mau'i, Lāna'i, O'ahu, and Kaua'i, where it grows at elevations of 100–2,300 m (330–7,500 ft). It requires 850–5,000 mm (33–197 in) of annual rainfall. Acidic to neutral soils (pH of 4-7.4) that are either an Inceptisol derived from volcanic ash or a well-drained Histosol are preferred. Its ability to fix nitrogen allows it to grow in very young volcanic soils. Koa and ʻōhiʻa lehua (Metrosideros polymorpha) dominate the canopy of mixed mesic forests. It is also common in wet forests. The koa's trunk was used by ancient Hawaiians to build wa'a (dugout outrigger canoes) and papa heie nalu (surfboards). Only paipo (bodyboards), kiko'o, and alaia surfboards were made from koa, however; olo, the longest surfboards, were made from the lighter and more buoyant wiliwili (Erythrina sandwicensis). The reddish wood is very similar in strength and weight to that of black walnut (Juglans nigra), with a specific gravity of 0.55, and is sought for use in wood carving and furniture. 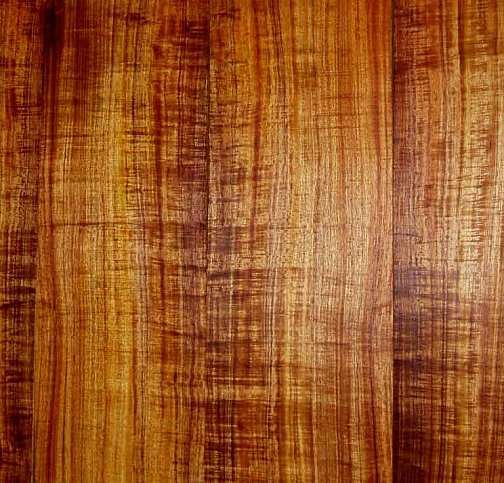 Koa is also a tonewood, often used in the construction of ukuleles, acoustic guitars, and Weissenborn-style Hawaiian steel guitars. B.C. Rich used koa on some of their electric guitars as well, and still uses a koa-veneered topwood on certain models. Fender also made a Limited Edition Koa wood Stratocaster in 2006. Commercial silviculture of koa is difficult because it takes 20 to 25 years before a tree is of useful size. 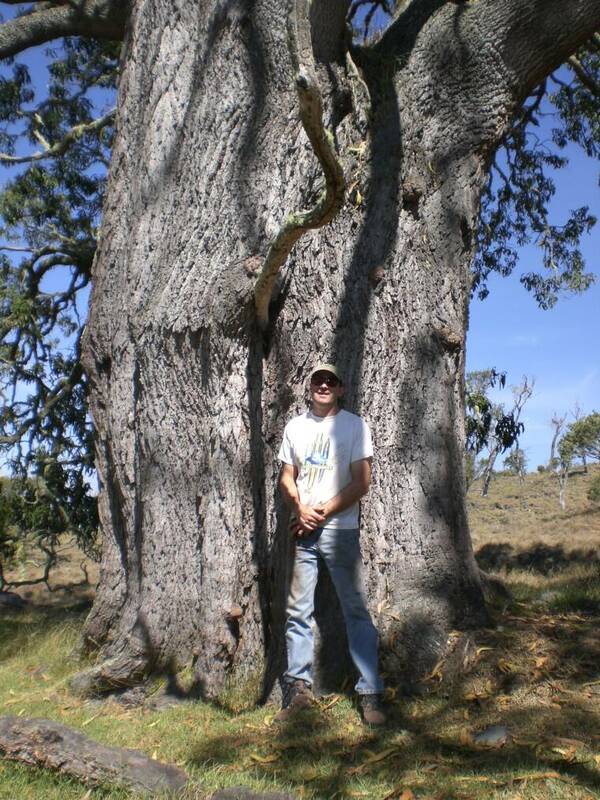 "Joe in front of a Koa tree..."
The koa population has suffered from grazing and logging. 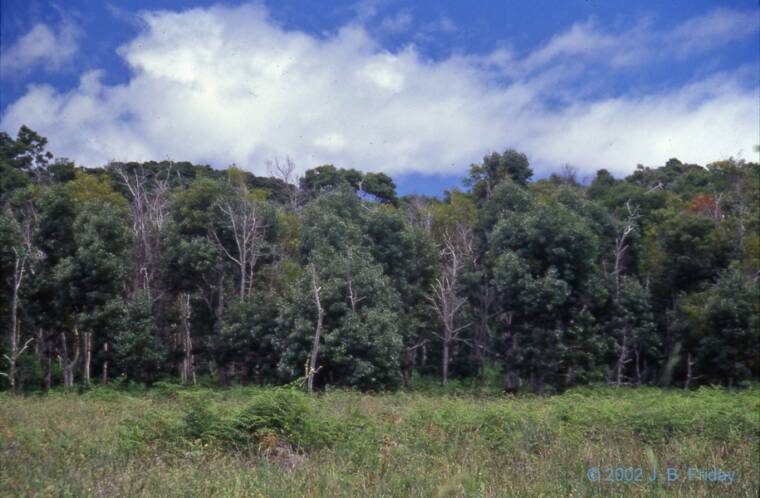 Many wet forest areas, where the largest koa grow, have been logged out, and it now comes largely from dead or dying trees or farms on private lands. Although formerly used for outrigger canoes, there are few koa remaining which are both large and straight enough to do so today. In areas where cattle are present, koa regeneration is almost completely suppressed. However, if the cattle are removed, koa are among the few native Hawaiian plants able to germinate in grassland, and can be instrumental in restoring native forest. It is often possible to begin reforestation in a pasture by disk harrowing the soil, as this scarifies seeds in the soil and encourages large numbers of koa to germinate. Experiments at the Hakalau Forest National Wildlife Refuge have shown that ōhi'a lehua (Metrosideros polymorpha) survives best in pasture when planted under koa. This is because koa trees reduce radiative cooling, preventing frost damage to ōhia lehua seedlings.